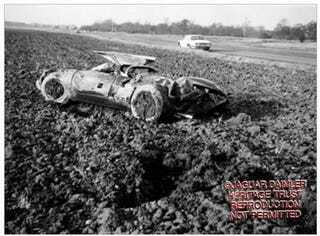 Came across this picture of what I’m assuming is the crash of the original XJ-13 in 1971. Now this got me thinking that I don’t think I’ve ever seen a picture of the original XJ-13 before the crash, and if Oppo has any leads on that it would be greatly appreciated. Here’s a pic I found that may be from before the crash, but idk. If there’s any car to rival the greatest Renaissance artwork, it might as well be this.